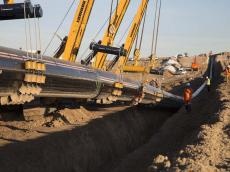 The Trans Adriatic Pipeline (TAP) project, which envisages transportation of Azerbaijani gas to Europe, allows for diversification of supply paths in Europe and thus benefits Switzerland, Swiss Federal Council told Trend. "Azerbaijan and Switzerland concluded a Memorandum of Understanding in the energy sector back in 2007, which laid the basis for the development of closer ties in this sphere. The implementation of the Trans Adriatic Pipeline (TAP) project is an excellent example of our relations in the energy sector, with a Swiss company being a founding member of the TAP consortium (then named EGL Group, now named Axpo)," said the Federal Council. Swiss Federal Council said the country considers supply security through diversification an important pillar of its foreign energy policy. "This is why Switzerland supported the Southern Gas Corridor from the beginning." "With 14 percent (2017) of the total energy consumption of Switzerland, natural gas is a noticeable contributor to the Swiss energy mix. Considering the decline in natural gas production in Europe, the TAP allows for the diversification of gas sources and supply paths in Europe and thus benefits Switzerland."